One very special puppy is on her way to becoming a lifelong friend for an animal at the San Diego Zoo Safari Park. 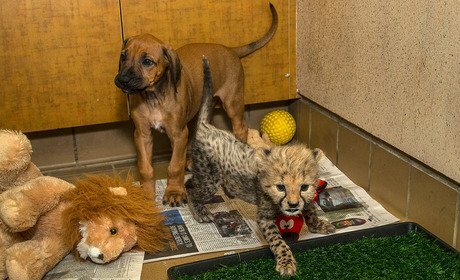 Raina, an 8-week-old Rhodesian Ridgeback puppy, was chosen to be the companion for a newborn cheetah who was rejected by his mother shortly after his birth. Typically, baby cheetahs are born in litters numbering between three and five cubs, according to the San Diego Zoo’s blog, though mother cheetahs can have as many as nine cubs at a time. But one little cheetah at the world-famous zoo, Ruuxa, was the only cub in his litter. Lone cubs are usually rejected by their mothers because instinct tells them these single cubs will not be able to survive in the wild. When Ruuxa was turned away by his mom, zoo staff had to step in — but they aren’t alone in making sure the cheetah cub has everything he needs to be a healthy, happy kitty. “Because the cheetah was by himself and did not have any siblings we wanted him to have a companion immediately,” explains Susie Elkhard, animal training manager at the San Diego Zoo. The zoo placed Ruuxa with who would become his very best buddy — Raina. “They definitely like to play, and when they take naps together, they often will snuggle up together for that warmth and closeness,” Elkhard says. The zoo has captured plenty of adorable moments between little Ruuxa and Raina, and they’ve even put some of those videos up on YouTube, much to the public’s delight. One video has already been viewed more than half a million times. Even though Raina is a dog and Ruuxa will grow into a large wildcat, the zoo says they will spend their lives together. Raina’s body language will serve as a reminder to her cheetah pal that there is nothing to fear, calming Ruuxa even in the event that the zoo must move him to another habitat. Cheetahs might be the fastest moving land animal, but they are also very endangered; according to the Los Angeles Times, cheetahs are often prey for other wild animals, including lions and hyenas. Programs exist at many zoos to rehabilitate and protect the cheetah population. The San Diego Zoo has paired orphaned and rejected cat cubs with canine companions for 30 years.